Mansukh Laxman Mandaviya is the Minister of State for Road Transport & Highways, Shipping and Chemical & Fertilizers in Government of India – A rare brand of politician who is both, erudite and popular with the masses. He holds a Post Graduate Degree in Political Science from Bhavnagar University. Starting his political career in the mid nineties, in a short span, has become a respected political leader of the masses. Mandaviya was born in a small village named Hanol in Palitana taluka of Bhavanagar district in Gujarat State. Born to a middle class farmer family, he is youngest among 4 brothers. 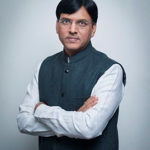 Mandaviya has played multiple leadership roles for both his political party as well as an elected representative of the people of Palitana, Gujarat. Politically he was active since his youth and became member of Akhil Bhartiya Vidhyarthi Parishad. He selected as a member of State Executive Committee of ABVP, Gujarat Unit. His organization skills were recognized by senior leaders in party and was given responsibility of Yuva Morcha of Palitana and then President of Palitana BJP unit. He has the distinction of being the youngest MLA in Gujarat in year 2002 at the age of 28 he fought Palitana Constituency. Being MLA, in year 2005 he organized 123 Km long padyatra for 45 educationally backward villages of Palitana for purpose of Girl Education. Again, in year 2007 he organized 127 Km long padyatra for 52 villages for cause of Beti Bachao, Beti Padhao and Vayasan Hatao (Give up bad habits). After his tenure, in 2010 he became chairman of Gujarat Agro Industries Corporation Limited. In a very short span at the age of 38, in 2012 he got elected in Rajya Sabha for Gujarat state. During his tenure in Rajya Sabha in opposition he raised many important questions of Gujarat. He raised very important question on patent for youth and researchers of country. He has been a part of various important standing committees of parliament over the years, namely petroleum & natural gas, chemical & fertilizers and industries. Was also member in consultative committee of environment, forest & climate change textiles and in select committee for real estate bill – 2015. He was also chairman of Gujarat state consultative committee of FCI. His organization skills were very important for party and he became Secretary for state unit BJP in 2013 and General Secretary in 2014. In the end of 2014 he became Gujarat State Incharge of BJP’s High-tech & Mega Membership Drive Campaign. By his thoughts, ideas and excellent organisation skill more than 1 crore people join BJP in Gujarat. Mandaviya is a seasoned public representative and has been recognized in several forums for his political acumen and skill. This ability has been recognized both nationally and internationally, as he has given speech in United Nations on the topic of “2030 Agenda for Sustainable Development”. Mandaviya was a part of President’s Delegation for three countries Ghana, Namibia and Cote d’lvoire. Mandaviya is well-known for his intellectual analysis and thought leadership on several topics including those related with fiscal issues. His analysis of the annual national budget is eagerly awaited every year. His thoughts and ideas on how the economic divide between the poor and affluent can be bridged have been appreciated by experts. As a very good learner Mandaviya had travels for many countries. He has visited China for the study of the development of Industries, Israel to study the new technology of Agriculture, Europe including England & Germany to study for the facility of urban development & technology, and food festival in Dubai & the study of free trade system. He also visits eastern African countries; Kenya, Ugandan, Tanzania and Ravanda for the study of forest life & culture. 5th July, 2016 he sworn as a Minister of State for Road Transport & Highways, Shipping and Chemical & Fertilizers in Government of India. After becoming the Minister; Mandaviya was a part of Vice President’s Delegation for South African countries – Algeria and Hungary.